Occasionally, every girl needs a break. On this particular occasion, all I was in charge of was a couple of side dishes. It was my turn to be treated to a scrumptious peppercorn encrusted grilled steak topped with a honey and blue cheese topping. 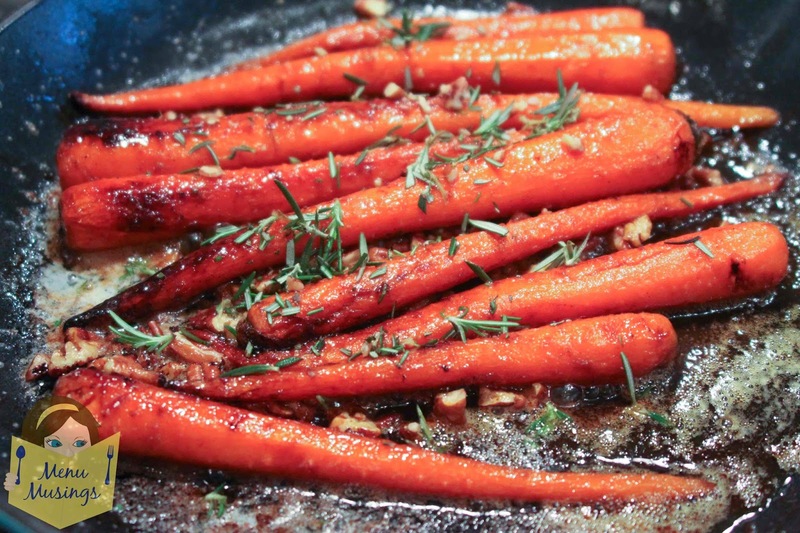 So I made some garlic and Parmesan mashed potatoes and these absolutely delightful braised baby carrots. The reason I'm passing this along to you, is that I find people are always looking for new ways to put veggies together on the table. Just to get out of the "steamed broccoli" rut, if you know what I mean. 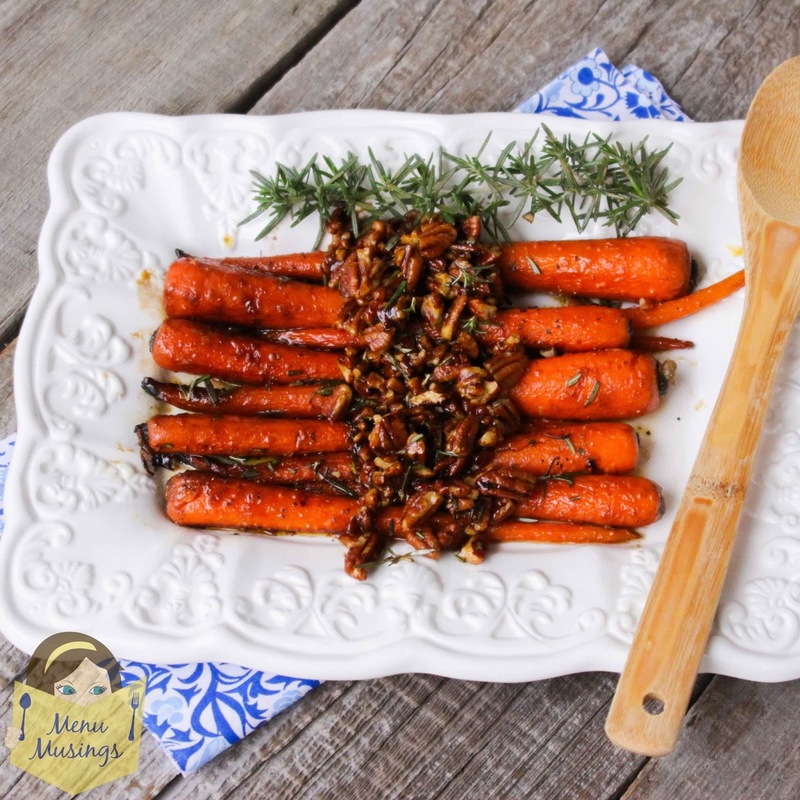 I personally think the carrots look very elegant served long like this on the plate. *Even better when you add a final sprinkling of cracked black pepper to finish these off. Something about that bite of the pepper really brings out the flavors in this dish. *For another variation, rather than the rosemary, add a chiffonade of a few fresh sage leaves at the very end of cooking. 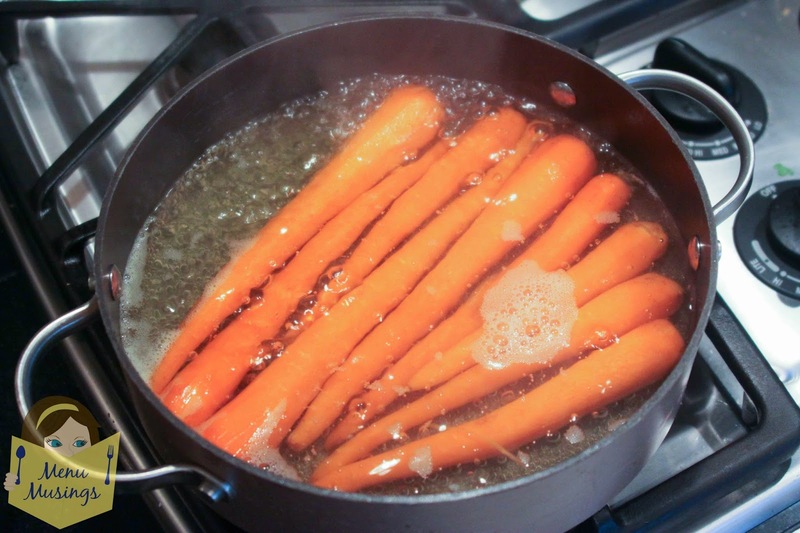 Add the baby carrots to a pot of simmering-boiling water and cook until about 2/3 done. Gently drain the carrots.. being careful not to break them. If you can't find baby carrots, the regular sized ones will work fine. Sometimes you can only find the baby one at specialty farmers markets. The full sized ones just need to cook a little longer to get tender. In a heavy skillet, add a couple of pats of butter. Cook on medium-high until butter is very hot and bubbly. Add the carrots. Cook in the butter until the butter gets a little brown color. Lower heat to medium. 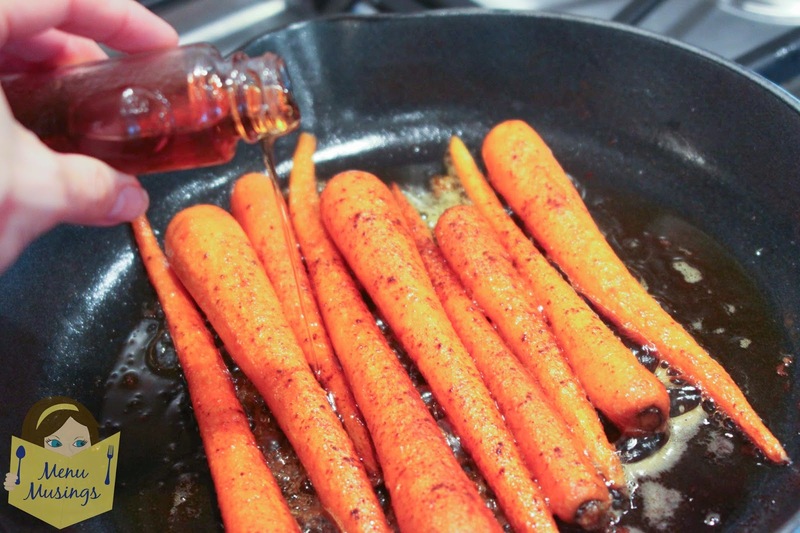 Add a sprinkle of cinnamon over the carrot. 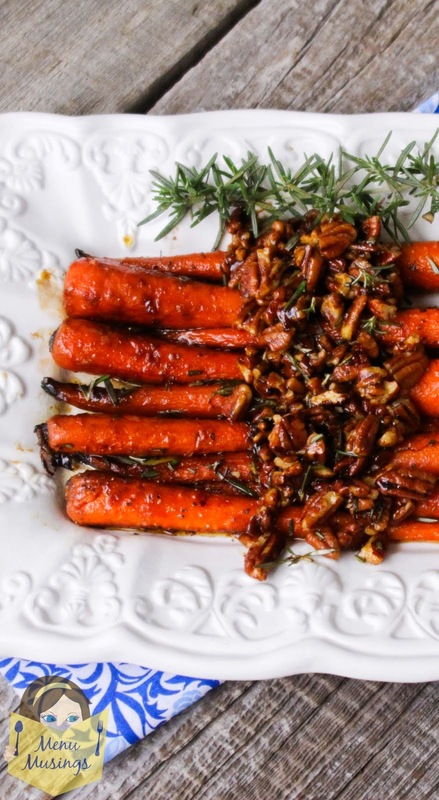 Add 2 -3 Tbsp maple syrup and a handful of chopped pecans over the carrots. Add part of a sprig of rosemary (about 3 inches worth) that has been stripped and chopped. Allow the liquid to reduce down to a glaze. Turn off the heat and allow to sit and thicken a bit. CAREFULLY remove to a plate. They will be very tender now and will break easily. Spoon the glaze and pecans over individual portions. 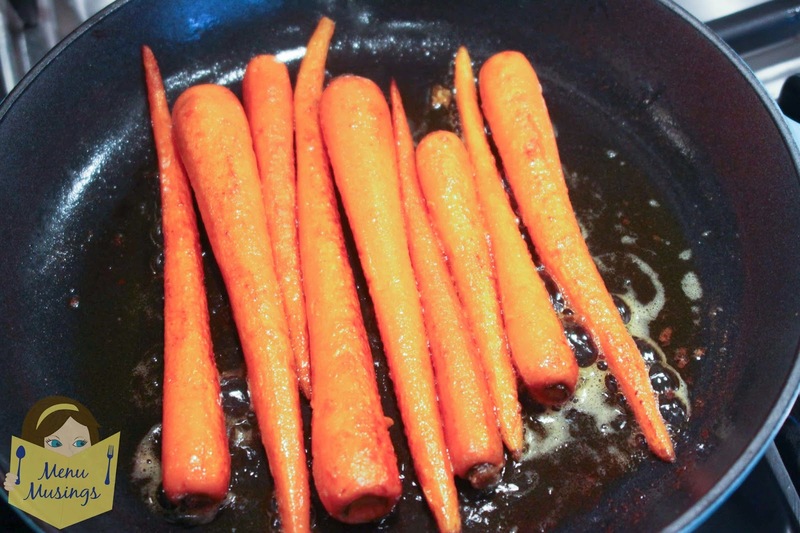 Tip - the more uniform the carrots, the more uniform the cooking will be. So look for skinnier carrots. I hope you enjoyed this recipe. 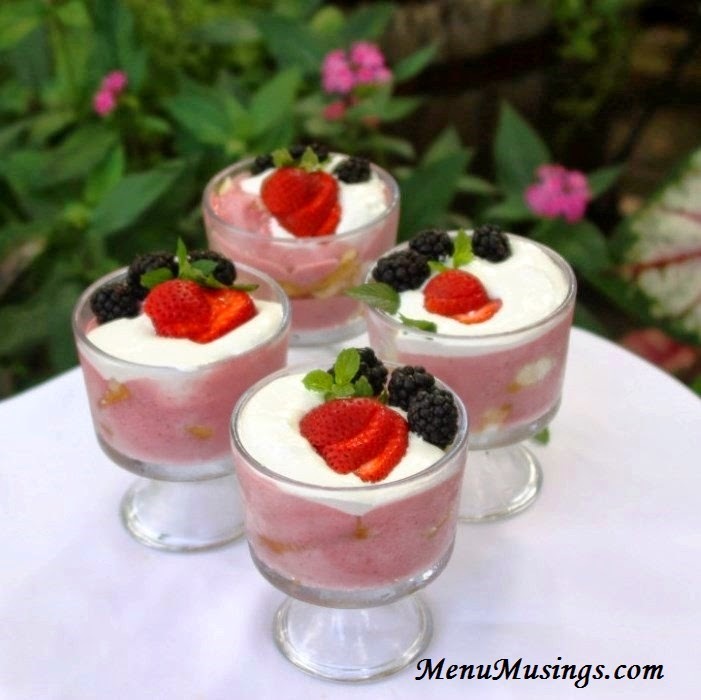 There is no reason why "ordinary" food can't taste great and be beautiful. 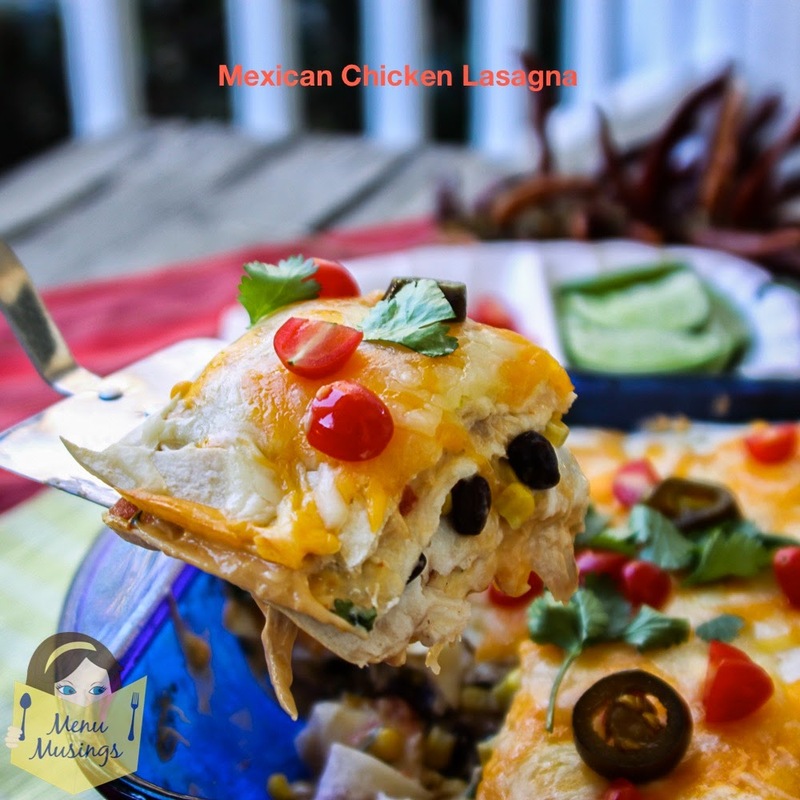 If you would like to check out more recipes, click on over to my Recipe Index where you are sure to find lots of ideas. 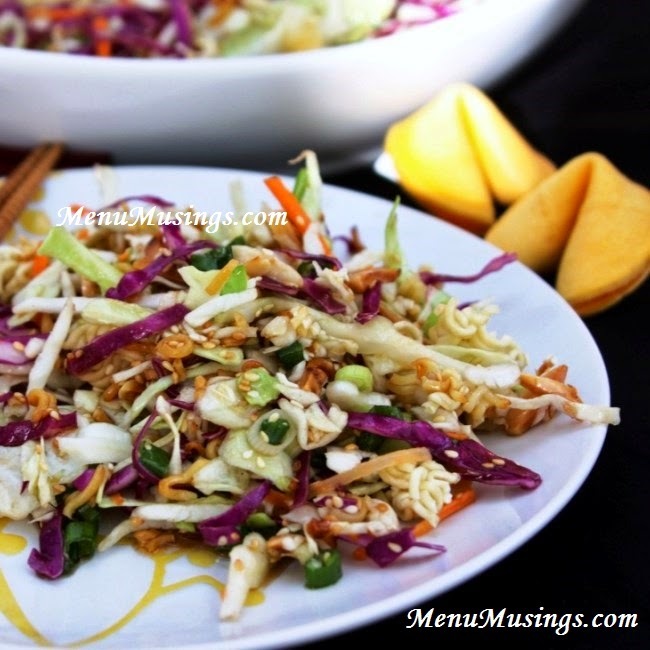 And by all means, Click here to subscribe to MenuMusings if you haven't already done so! 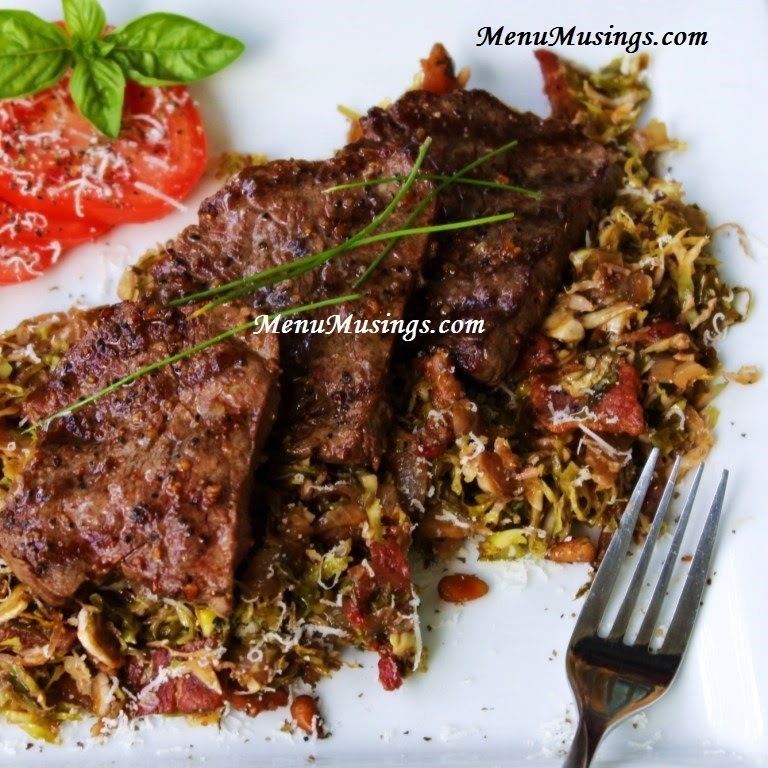 As always, here are some "bonus" recipes for you. Just click the links to go there. In a small seasoned black iron skillet, add a couple of pats of butter. Cook on medium-high until butter is very hot and bubbly. Add the carrots. Cook in the butter until the butter gets a little brown color. Lower heat to medium. 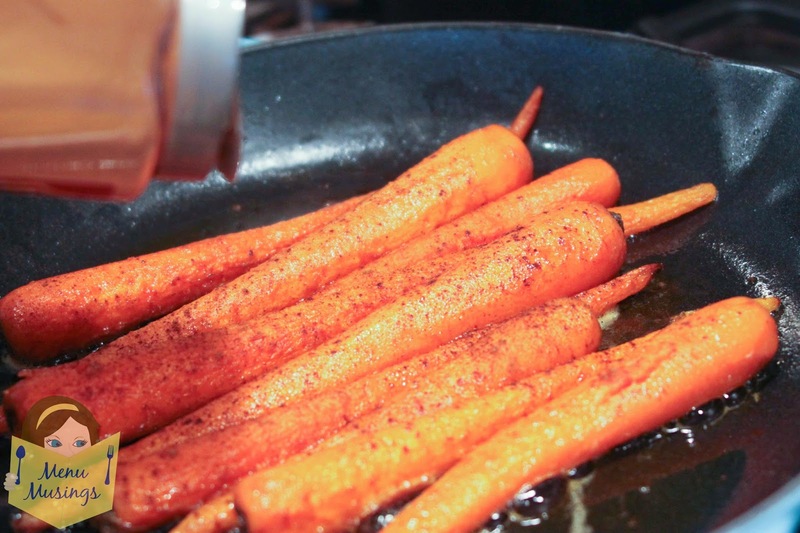 Add a sprinkle of cinnamon over the carrot. 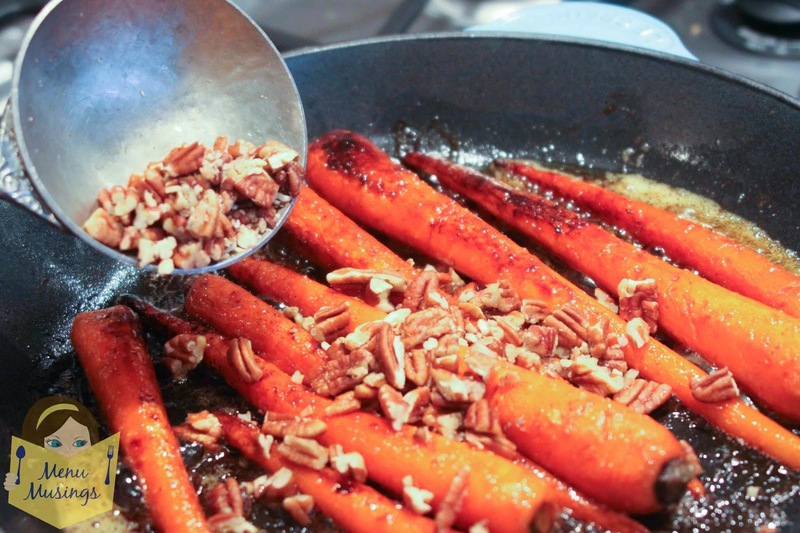 Add 2 -3 Tbsp maple syrup and a handful of chopped pecans over the carrots. Add part of a sprig of rosemary (about 3 inches worth) that has been stripped and chopped. Allow the liquid to reduce down to a glaze. Turn off the heat and allow to sit and thicken a bit. CAREFULLY remove to a plate. They will be very tender now and will break easily. Spoon the glaze and pecans over individual portions. Braising is a (usually slow) cooking method that is begun on the stove top then followed by simmering in liquid. 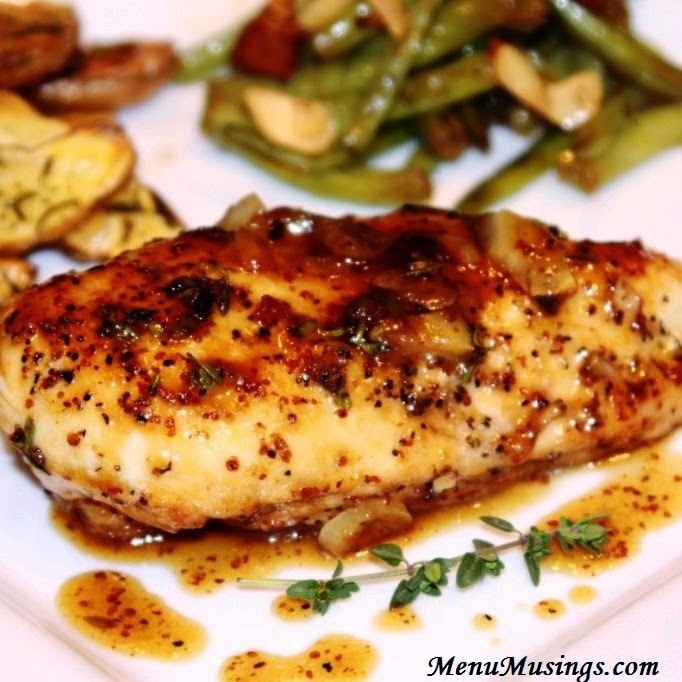 Braising is a popular way to cook less tender cuts of meat. 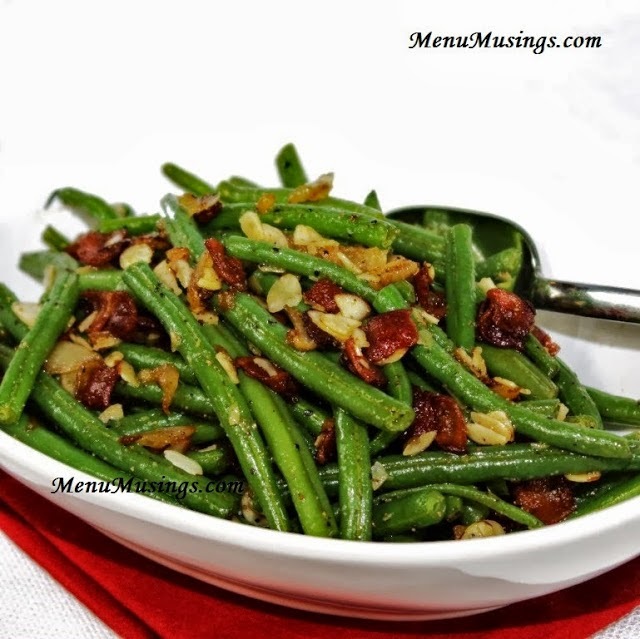 When cooking vegetables, the method is an effective way to infuse them with the flavor of the braising liquid.